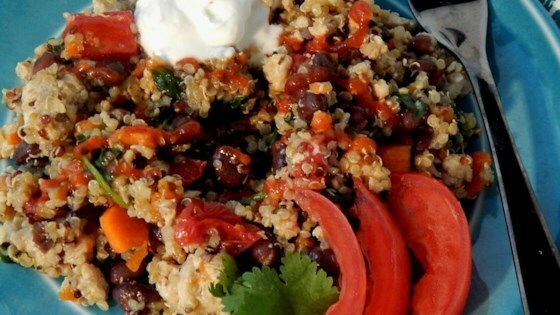 "I took some leftover quinoa pilaf and added black beans and ground turkey. It made an excellent one-dish meal that hits the table in a hurry. I found it was a good way to use up the leftovers from another dinner. We have the pilaf as a side dish for the two of us, and it is always too much. Adding ground turkey and black beans makes another unique meal that is quick to prepare. Enjoy!" Heat 2 teaspoons olive oil in a saucepan over medium heat; cook and stir onion in hot oil until translucent, about 5 minutes. Reduce heat to medium-low, stir quinoa with the onion, and cook, stirring constantly, until the quinoa is lightly toasted, about 2 minutes. Pour water into the saucepan; add bouillon granules, black pepper, and thyme. Bring the liquid to a boil, place a cover on the saucepan, reduce heat to low, and cook at a simmer until the quinoa softens, about 5 minutes. Stir carrot into the quinoa mixture, replace cover, and continue to cook at a simmer until water is completely absorbed, about 10 minutes more. Remove saucepan from heat. Stir tomato and baby spinach into the quinoa mixture until the spinach wilts, about 2 minutes. Heat 2 tablespoons olive oil in large skillet over medium-high heat. Cook and stir turkey in the hot skillet until browned and crumbly, 5 to 7 minutes; drain and discard grease. Reduce heat to medium-low. Stir black beans with the turkey; cook and stir until the beans are hot, 2 to 3 minutes; add the quinoa mixture, stir, and cook until heated through, about 5 minutes more. I add about 2 ounces water when using leftover pilaf and mixing with the turkey and beans; it turns out perfect! May be better with chicken or beef. Delicious and easy to make. I sautéed garlic in with the onion, doubled the veggies and added chopped cilantro. I also cooked in a splash of Chalula. We will make again!! good combination of ingredients..this took 30 mins to make though. not 60.